April is Autism Awareness Month and tomorrow is World Autism Awareness Day. I feel like I ought to say something profound. Truth is, I live with autism every day. It is "normal" to me. The CDC says the numbers are 1in 50 school age kids now. So, maybe it will be "normal" to you soon too. Those of you who have met my son know that he is not a statistic. He is a CHILD. 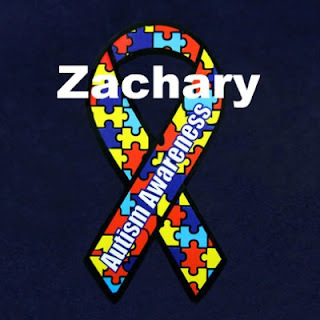 Zachary is a beautiful little boy who happens to be autistic. He is funny and sweet and has overcome more in the past few years than most people do in a lifetime. He doesn't speak very well, but he communicates in very creative ways. He struggles every day to do things such as eat a meal, grip a pencil, and brush his hair. But, he never gives up. And he has taught me more than I will ever teach him. Tomorrow is just another day for us--we try to make the world aware every day. Next step? Acceptance. Please bring awareness to autism. This is my 1 in 50! Amazing post. Your little boy is gorgeous. We have not know many children with Autism.. or people for that matter .. Our grandchildren are friends.. with a family who's son has a form of Autism .. they do not really talk about it .. Like you said.. it is normal to them .. Our grandchildren live with us.. that is normal for us .. I guess .. Each of us have our own Normal .. I try to think out side the box.. and to learn from each new experience.. Knowing that God leads.. us to each person in our lives.. we can learn from them or teach them something we know .. I Love that.. We serve a living God .. Who loves us.. right where we are .. I Love that I can see His Hand in this Meeting .. it is not about anything other than Life's Lessons .. As you will soon see.. with LisaMe! I live in the Season's of Life .. I am happy to say.. today.. I am happy .. knowing .. I am expanding .. the territory ,, in my brain.. to know that Autism is a way of life for many .. and although we pray for a cure .. or should I say pray for better understanding .. I feel so Blessed today .. to have come across your path .. You have a nice looking son .. My grandchildren.. would enjoy his company They are wonderful children .. who do not judge because someone is a little different.. then what some people would say is normal .. What is normal anyway .. Children are children .. Love is Love.. My grand daughter and I had a conversation today about how God loves all the children of the world.. no matter their differences.. I thank God for you.. and the obvious Love you have for your son :) To me that is what is Normal .. For a Mother to Love their child .. unconditionally ... And for people to love one another unconditionally .. This is what is Normal to me .. I Love that I met you .. Truly LisaMe! My son is also Autistic, and I was clueless about it until you(Cyndie) talked to me about it. I am so thankful that I have you as a friend. Your experience was really crucial for me being able to adapt as well as I was able to. I an so thankful for your support. ♥ Thanks for sharing your experience with me, and your story with everyone. You and Z are both amazing. I knew YOU would appreciate this post!! <3 to you, too!! Zach is one handsome and smart son Cyndie.I hope im still around to see what he does an adult as you have taken him very far in life thus far.Keep spreading the word.God bless you and ZBomb my friend♥! That is so sweet of you, Terri!! Oh Cyndie. You are a beautiful person for writing about this and telling us your story. I love that you learn from him. We can learn a lot from this. God bless you and your family. Kids with special needs are precious. thank you for sharing this wonderful story, they are the precious kids on earth that needs a loving care. i'm sure God gave you Zachary for He sees how loving family you guys are. I commend you for being so strong, your son is so blessed to have you as a Mom! What a beautiful boy you have there. Being a stay at home mom, I meet parents at the park with their children that are affected by Autism, they are a great group of kids. Honestly the parents and children all amaze me, the children are so brilliant. It takes a while for some of them to let you close enough to talk to them, but once they get to know you, they open up and show you how lucky you are to know them. I'm glad that he never gives up, he's a fighter! Parents with autism child, children should learn how to accept it and things will be fine! You're a strong mom! Thank you so much for raising awareness about this important issue! I truly hope and pray that one day soon people will realize that just because a child is autistic it does not mean he is any less of a person and does deserve the love and understanding of all. I believe awareness is a very important key to bring acceptance. Thank you for sharing your story it was very touching. Reminds me when I was pregnant with my son, the doctor found an abnormality into one of my tests so she sent me to a specialist. The said specialist suggested that I should get the amniocentesis because my son has a chance of being autistic when born. The said procedure has also the chance of possible miscarriage, I told the doctor right there and then that no matter how my son would be born, I will never do the procedure. I would still love my son no matter what. As it turn out, my son is perfectly fine when he was born. Thank you for sharing your beautiful little boy and your story with all of us! You have a good looking boy there. Autism is also normal in my family, I have a cousin who has it and he is such a good boy. There were times that he had trouble dealing with the crowd, but for me, his behavior is way better than those without autism. He is such a thoughtful person. He is my son's best friend and they both cry when they separate from being together for a week. I love my cousin, he is a blessing to my aunt and her hubby. Great post! I am of teach of students with autism and both of my nephews are autistic so this is "normal" for me as well. I wish more people would take the time to learn about autism! Autistic children are SO special <3 Their minds are simply amazing. I have a handicap sister, so I understand how hard it is to accept a new normal, but the more people your son meets - the more lives he has the potential to change.